In Korea, there is no end to what people can see and experience, but trying Korean food is on the top of most to-do lists that visitors cannot wait to cross off! The Korea Tourism Organization has chosen the following 14 best dishes that are rated “must-eat” items when in Korea. So let’s explore these fourteen bests that are sure to impress you with Korea’s true flavor! 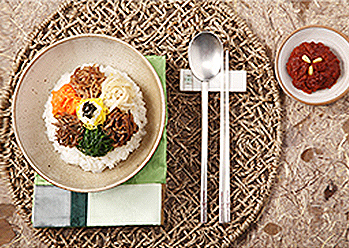 Bibimbap, or cooked rice mixed with vegetables, sautéed beef, and twigak (dried seaweed or vegetables fried in oil) is one of the definitive Korean meals. There are three common beliefs about the origin of bibimbap. One theory is that it stemmed from the practice of mixing bap (cooked rice) with other dishes used for the ancestral rite of eumbok. 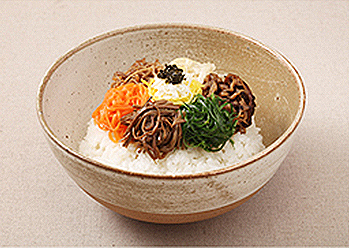 Others say that bibimbap originated from mixing leftovers together as a midnight snack on Lunar New Year’s Eve. The last theory is that farmers out working the fields would each bring a portion of food to be mixed together for meals and divided out evenly. 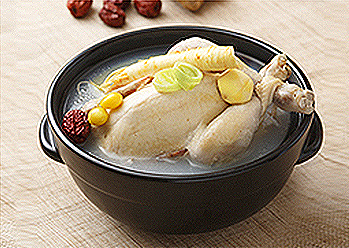 Samgyetang is made by simmering a whole young chicken stuffed with ginseng, hedysarum root, jujubes, garlic, and sweet rice. Considered an energy-boosting dish best eaten on hot days, it is a classic Korean dish that has become popular among diners of all nationalities. Japanese author Murakami Ryu and Chinese film director Zhang Yimou have both given extensive praise to the dish. 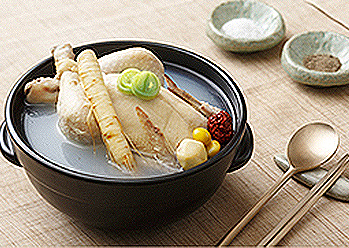 Korea even has a day dedicated to eating samgyetang, an example of the food’s popularity. Bulgogi is prepared by marinating thin slices of beef in a sweet soy sauce mix before grilling them. Bulgogi is a high-class meal, only being served in the royal court and yangban (noble) households in the past. 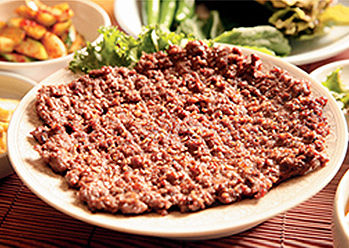 Bulgogi originated from a dish called maekjeok. Maek was the name of the northeast region of China and a reference to Goguryeo, one of the earliest Korean kingdoms. 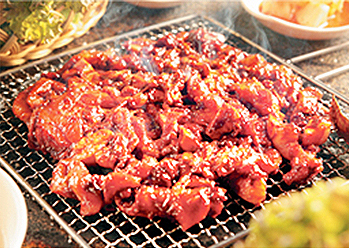 Maekjeok is made with barbecued beef skewers, and according to folklore, evolved into present-day bulgogi through the introduction of grills, which made skewers obsolete. 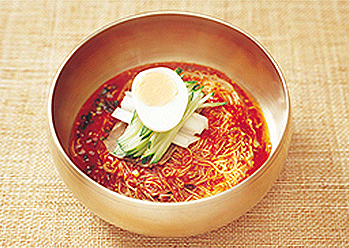 Naengmyeon, cold buckwheat noodles, is considered a summer food, but that wasn’t always the case. It used to be enjoyed over a warm ondol floor (subfloor heating system) during the freezing winter temperatures. The broth was made with the brine of dongchimi (radish water kimchi) scooped out of a large jar half-buried in the ground during the winter. Although its origin remains unclear, based on the fact that buckwheat was introduced by the Mongol Empire during the Goryeo Dynasty, the theory is that the buckwheat was first made and consumed as noodles from the northern mountain regions. 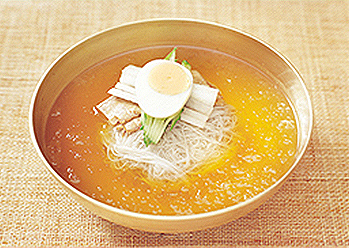 Recipe for naengmyeon varies by region; in particular, Pyeongyang naengmyeon is quite popular for its unique recipe that originated from North Korea. Kimchi is a fermented dish made with vegetables and a variety of seasoning ingredients. At a time when storage methods were not well-developed, kimchi was an important source of vitamins in the winter, when fresh vegetables were unavailable. There are over three hundred varieties, but when it was first made prior to the Three Kingdoms Period (AD 57-668), it required a very simple recipe of salting and storing napa cabbage in a ceramic container for fermentation. What was originally a simple salted pickle has now become a complex dish requiring assorted seasonings and varies according to climate, geographical conditions, local ingredients, methods of preparation, and preservation. Sundubu starts out being made in the same manner as ordinary tofu, first boiling chopped soy beans and then coagulating it by adding brine. However, sundubu leaves out the later steps of draining and pressing the lumpy bean curds, giving it an easy-to-digest silky, light texture. In Chodang Dubu Village, a village in Gangneung, Gangwon-do famous for its sundubu, clean water from the East Sea is used as brine for thickening. 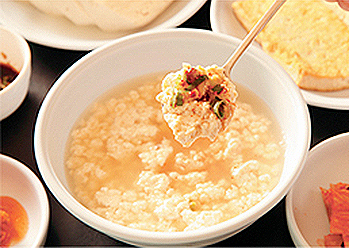 It started when Chodang Heoyeop, a magistrate of Gangneung region in the middle of the Joseon Dynasty, made tofu from the sea water coming from the spring in his front yard instead of brine. The name Chodang was then adopted from Heoyeop’s pen name. 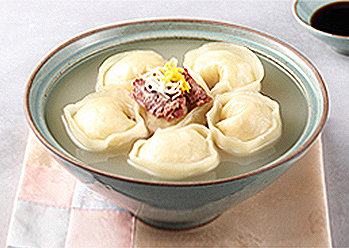 Mandu is a steamed dumpling made by placing a filling of ground meat and vegetables onto a round, thinly rolled wrapper and sealing the edges. They were initially prepared for ancestral rites or banquets and enjoyed as a special dish for cold winter days. 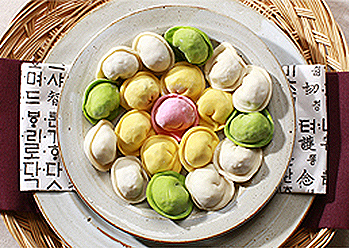 When discussing the origin of Korean dumplings, a famous folk song called “Ssanghwajeom” (dumpling shop) from the Goryeo Dynasty is frequently mentioned. The song describes how a group of Uyghurs arrived and opened up dumpling shops, and also how the people of the day greatly enjoyed the dish. Some people refer to the song and joke that a Mongol who opened a dumpling shop in 1279 may have been the first foreign investor to live in Korea. 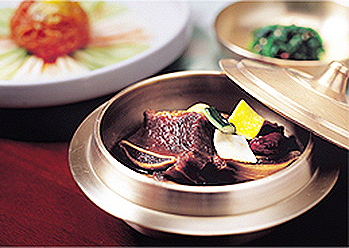 Galbi jjim (braised short ribs) is made from the finest and most expensive cut of beef. As such, galbi jjim is usually only eaten on special occasions or holidays, when family members come together. 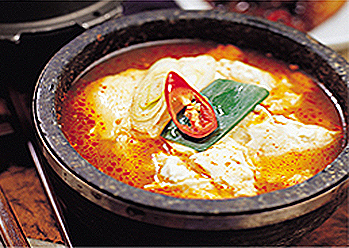 Korean cooking consists of a large number of braised dishes that require considerable culinary skill. 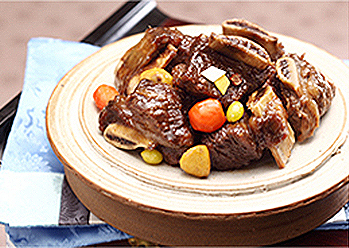 Galbi jjim is one such dish, growing in popularity among international diners as well. When making galbi jjim, the fat on the short ribs is carefully removed before braising. Carrots, ginkgo nuts, and chestnuts are added, and finally pyogo (shitake mushroom) and egg garnish are sprinkled on top to complete the preparation process. Glazed with soy sauce, galbi jjim not only has a rich taste but a mouth-watering visual presentation. 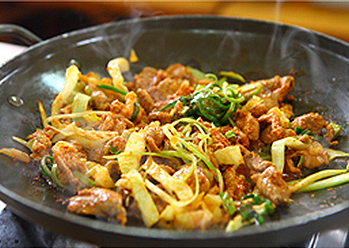 Jeyuk bokkeum (spicy stir-fried pork) is one of the best-known dishes cooked with gochujang. It is a stir-fried dish with thick slices of pork shoulder marinated in a spicy seasoning. 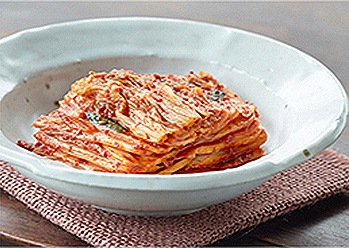 Before the 1950s, it was reportedly made using only scallion, black pepper, and soy sauce, but the current form of gochujang-marinated jeyuk bokkeum is believed to have appeared sometime afterwards. 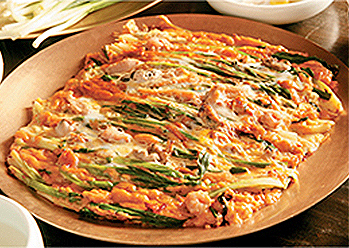 Because it is a hearty yet inexpensive meat option, young people on limited budgets favor jeyuk bokkeum. 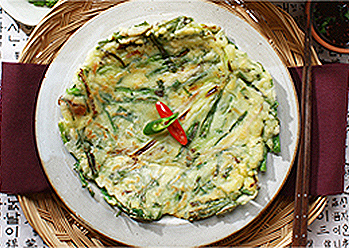 Pajeon (green onion pancake) is a mixture of wheat flour batter and scallions shallow-fried on a griddle. It goes wonderfully well with chilled dongdongju (floating rice wine). For some reason, people associate rain with pajeon. Some say it’s because the sound of raindrops hitting the ground or a window sill reminds people of the sizzle of spattering oil as the pajeon is fried. As strange as it sounds, this theory may not be as far-fetched as you might think. According to an experiment conducted by a sound engineering lab, the two sounds have almost identical vibrations and frequencies. 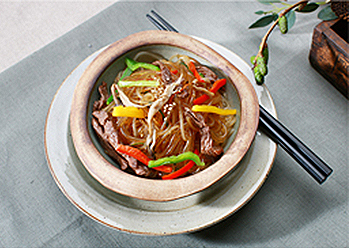 Japchae (glass noodles with sautéed vegetables) is made by boiling glass noodles then draining and mixing them with stir-fried vegetables and meat. No Korean festivity is complete without japchae. It has long been perceived as a luxurious and elegant dish, and was always served on birthdays, weddings and 60th birthday celebrations. Japchae was first created in the 17th century when King Gwanghaegun of the Joseon Dynasty hosted a palace banquet. It is recorded in the Gwanghaegun Ilgi (Daily Records of King Gwanghaegun’s Reign) that Yi Chung, one of the king’s favorites, had the habit of personally presenting unusual dishes to the king. 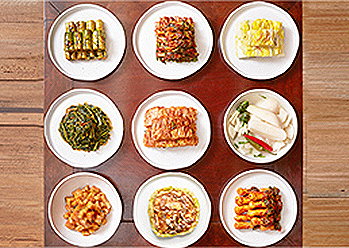 Gwanghaegun relished these dishes so much that he would not start a meal until they arrived. 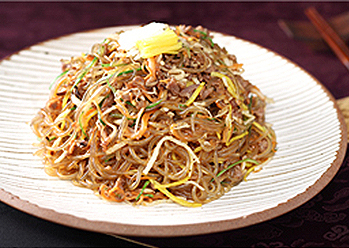 Among these unique dishes was japchae, which the king favored over all the rest. Gimbap is made by spreading white rice on a sheet of gim (dried laver), layering it with spinach, pickled radish, carrots, egg, and beef, and then rolling it up like sushi. 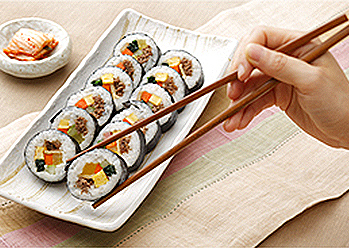 It was in the 1960s and 1970s that the gimbap we know today - rolled up into a cylindrical form - became popular. This rice-roll was the default picnic lunch for annual spring and autumn school outings. 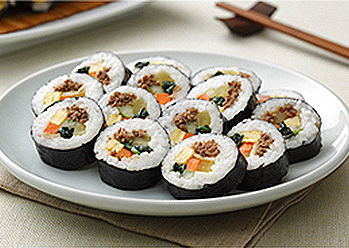 Many Koreans fondly remember eating the end pieces of the rolls while their mothers prepared gimbap on the morning of school field trips. 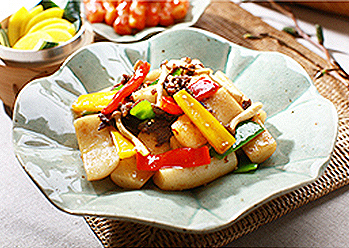 Originally, tteokbokki was not a spicy dish. 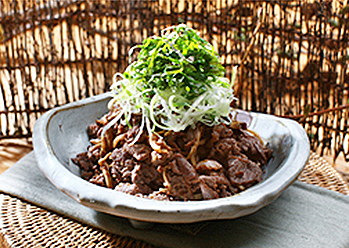 In the royal courts of Joseon, it was prepared by simmering beef, carrots, onions, pyogo (shitake mushroom), and other ingredients together with rice cakes in soy sauce. The colorful ingredients made it visually appealing as well as nutritional. 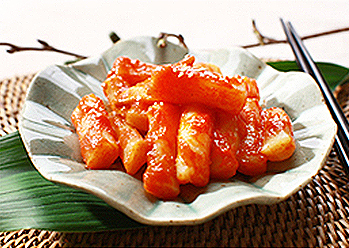 It is believed that tteokbokki seasoned with spicy gochujang paste first appeared in the 1950s and became widely popular in the following years. Dak gangjeong is made by deep-frying chicken coated with flour. 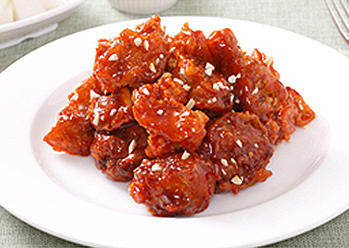 The fried chicken is then smothered in a sweet yet spicy sauce that has been boiled down. The dish sold at Sokcho Tourist & Fishery Market (Jungang Market) is famous for being served cold. 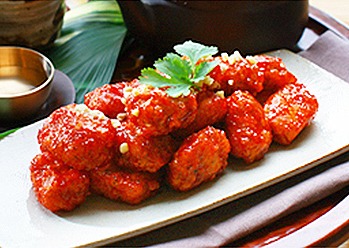 The dak gangjeong is popular among all for its sweet and spicy taste, and for retaining its crisp and chewy texture despite being served cold.